I must admit that I’ve seen this film a few weeks ago. Probably the fact that Eddie Redmayne was nominated for an Oscar, prompted me to see if he was a worthy contender for the coveted golden statuette. And the only thing I can say is that he totally deserved to win with his magnificent performance. I love to watch a biographical movie now and then. The only drawback is that I’m always a little bit disappointed about the subject covered in such a biopic and that the emphasis lies on something I wasn’t looking for. In “jOBS” I missed the philosophy this visionary had about the Apple phenomenon and the development of the applied interface (which is currently perfectly normal for everybody). The clash between Jobs and Gates was cited as a fait divers, whereas that interested me. 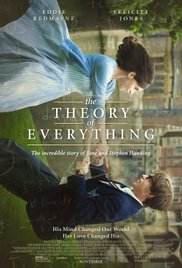 Also in “The Theory of Everything” the focus was on other facets of Hawking’s life. What applies to both these films is the fact that the protagonists physically look an awful lot like the corresponding character. It’s creepy to see how they both manage not only to capture the emotional part, but also to match the characteristics and physical traits of these famous people. “The Imitation Game” is obviously also a biopic which, however, had a more adventurous twist rather than being a purely biographical sketch. You must admit that the performance of Eddie Redmayne is simply magnificent. Both excerpts from the college years, where he’s still healthy,lively and the way he finishes his studies in a nonchalant manner, as the portrayal of a genius who’s struck by a muscle disease, are brilliant and striking. A series of events wonderfully visualized using a variety of intense colors at certain times. The university professor who looks surprised at the solutions scribbled on the back of a timetable (10 math assignments which are almost impossible to solve I suppose, of which Stephen could ONLY solve 9). A family dinner Jane was invited to and where you already can get a sense of the intellectual atmosphere. The contradictions between Jane and Stephen when it’s about religion. Hawking who excludes everyone after hearing the terrible verdict and the determination of Jane. These fragments stayed with me and made it a fascinating film. Which theories the brilliant mind of Hawking produced in that cripple body, isn’t explained in detail. Here and there black holes, big bangs and the concept of time is mentioned, but eventually I was wondering what exactly Stephen Hawking’s ultimate contribution was to mankind. What Jobs achieved you can discover in any computer shop. And from Turing we know that he has broken the Enigma code. But what abstract evidence Hawking delivered, wasn’t clear to me. From one moment to the other he’s a celebrity and a much sought-after guest speaker. That a woman who lives together with a paralyzed person can’t really enjoy a thrilling,romantic life and that she’s actually the person who’s responsible for all practical matters in a marriage, is of course obvious. And that’s the central theme of this biopic: a loving relationship slowly falling apart because of a fatal disease, the awareness of limitations and the danger to seek solace in someone else’s arms. So it’s mainly a biopic about the wife of Hawking, instead of about Hawking himself. An insight into the life of mathematical genius, who could explain the mystery of the origin of the universe by using his phenomenal intellectual brain, is thus transformed into an ordinary dime novel about an unhappy woman who feels abandoned by her ever loving husband. And that’s something I wasn’t waiting for. Despite the romantic approach, I think it’s an admirable film. The situation Hawking is facing during his life, ensured that other qualities came up : humor and willpower. These two qualities are subtly incorporated into this film. Even the choice Hawking made at an older age about his marriage, took me by surprise (actually it wasn’t much I knew about the life of Hawking). Once again this proves that he sees himself as a normal functioning man. “The Theory of Everything” is a beautiful film that actually moved me and should serve as an example to show what one can achieve with the right attitude and a big portion of perseverance.